On Monday we throw the mail on the kitchen table, Tuesday the ottoman, Wednesday the bench in the front hall, and by Friday the house is cluttered in paper. Solution: Everything needs a home. 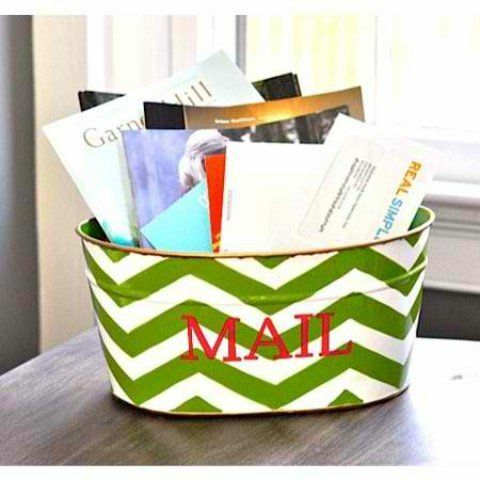 Designate a place for the mail so that when you walk through the door you know exactly where to put it. This keeps it contained until you have time to deal with it, reduces clutter, and cuts down on important things (like bills or appointment reminders) getting lost in the shuffle. 2. Not putting things away after you use them. Dirty dishes belong in the dishwasher, not in the sink or on the counter. It takes SO much less time to put things away right after you use them than to let them build up and eventually form into a massive, unmanageable pile. If you take something out, put it away. It’s as simple as that! 3. Not scheduling time on a consistent basis to let items go. It is important to look through your clothes and household items regularly (once a month will do!) and remove anything that you no longer love, need, or that’s broken. Designate a large canvas or brown paper grocery bag for items to be donated and take it to the donation center whenever it gets full.